The easy-to-operate compression lever (in the open position here) has the standard three settings: climb, traverse, and descend. For years, mountain bike shocks on longer travel trail/all-mountain bikes came with inherent compromise. Opt for a coil and relish the frictionless off-the-top feel and zero-fade performance, but suffer the weight and climbing platform penalty, and deal with lessened versatility. 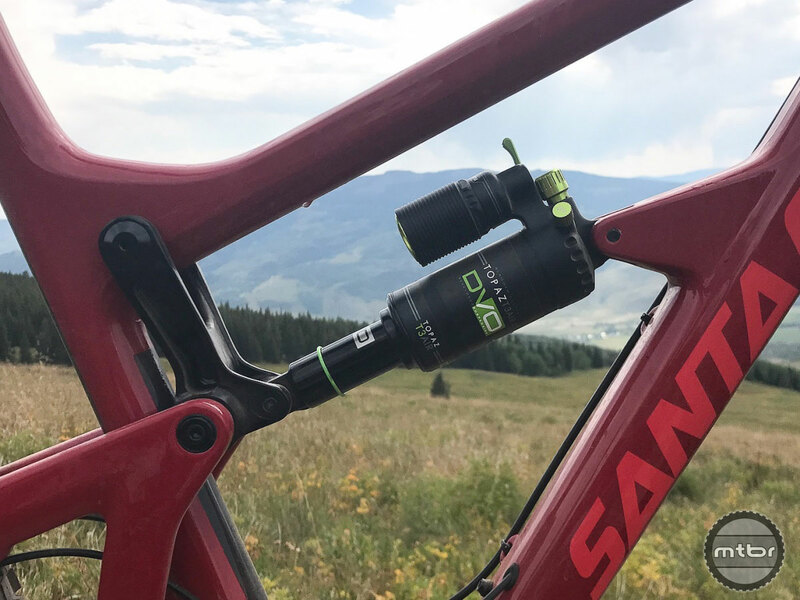 Or choose air to weigh less (often pay less) and gain adjustability, but accept sometimes sticky initial sensitivity and performance fade on long, rough descents. More and more, though, the current generation of piggyback air shocks are closing the gap to their coil brethren. The DVO Topaz T3 Air has earned its place on this Santa Cruz Hightower dream build. 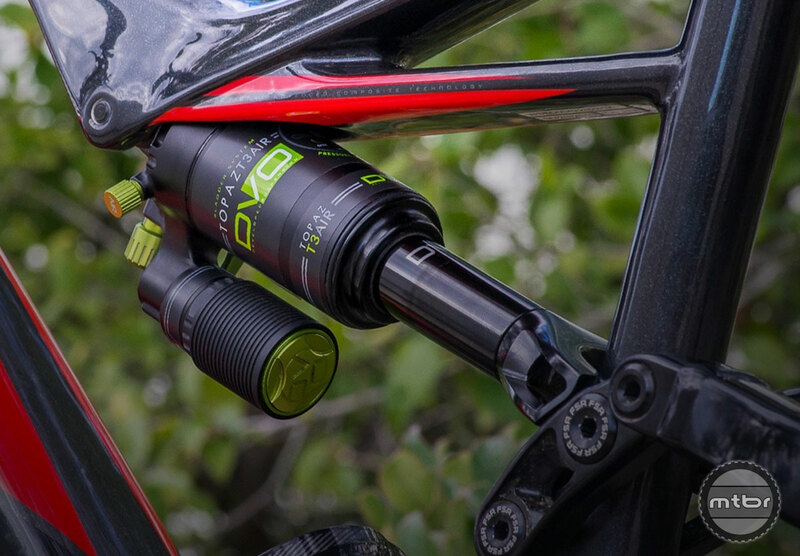 Among this next gen group is the DVO Topaz T3 Air, which weighs a reasonable 393 grams when configured for our 135mm rear travel Santa Cruz Hightower test bike with 200×51 shock size. It has buttery smooth initial stroke performance, is supportive in the mid stroke, and delivers near bottomless end stroke performance. Elevator pitch highlights of the Topaz T3 Air include significant (and easy to do trailside) tunability thanks to snap-on positive and negative air volume spacers for a more progressive or linear feel, heat managing cooling fins that help decrease fade, durable Trelleborg seals and Igus bushings, and an oversized three-position on-the-fly compression adjustment lever (climb, traverse, descend). The shock’s exterior body is beautifully machined, yielding a durable and attractive aesthetic. Yet another notable feature is the shock’s bladder pressure adjustment (from 170-200 psi), which changes the entire stroke behavior. If you feel like your bike is pushing through the travel too quickly, bump up the psi. But if you want the shock to go through more travel because you’re not getting full travel, let some air out. In essence, you are shifting the entire spring curve up or down, not changing that curve’s shape. That, of course, happens when you add or subtract the volume spacers. The Topaz T3 Air has a buttery smooth initial stroke, is supportive in the mid stroke, and delivers near bottomless end stroke performance. 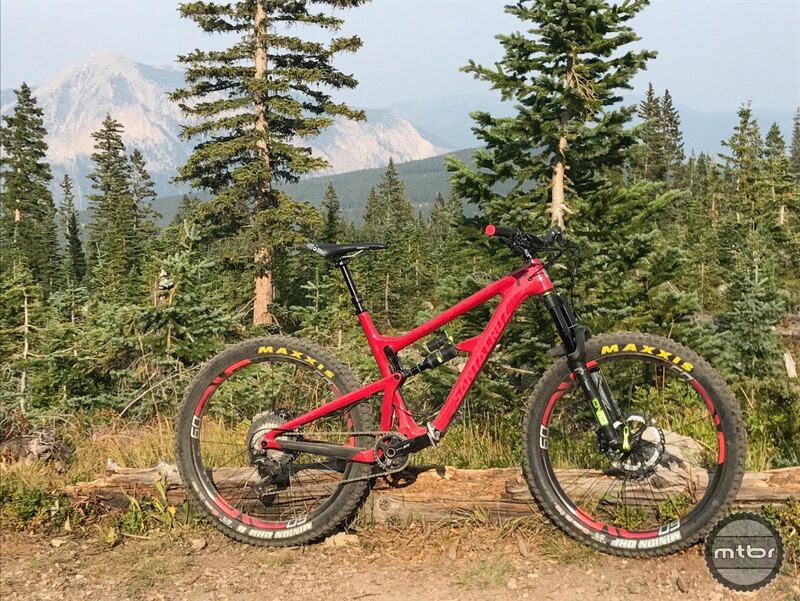 Currently the Topaz T3 Air comes in five sizes (216×63.5, 216×57.5, 200×57, 200×51, 190×50), and they make Specialized Stumpjumper and Enduro-compatible versions for all the Big Red S devotees out there. Price is $500 and if you have questions reach out directly to DVO, which has a reputation for some of the best customer support in the cycling industry. 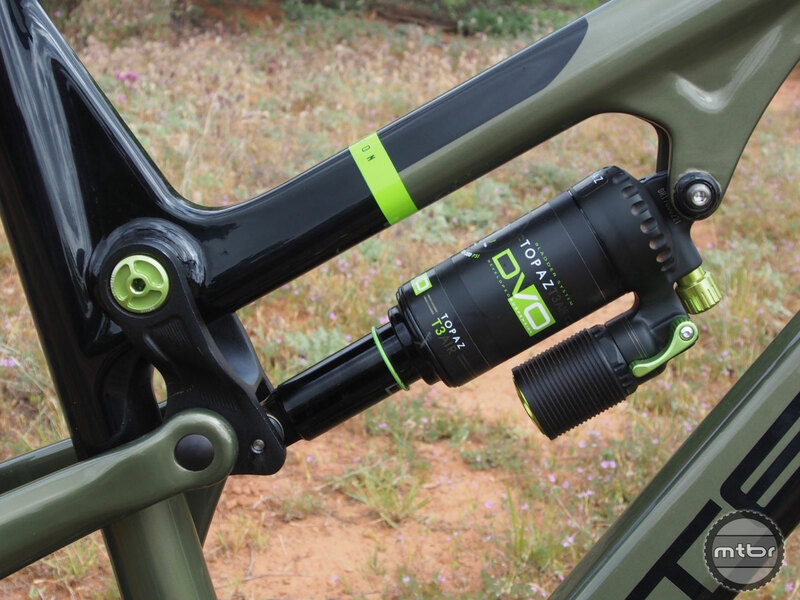 Intense are such big fans they launched a special edition DVO Recluse earlier this year outfitted with both the Topaz T3 Air and Diamond fork. The trip down, not surprisingly, is shred’tastic, all those tricky uphill bits transforming into a playground of rowdy and raucous fun. It’s “enduro-style” riding at its finest — and a great locale for evaluating suspension performance. To cut to the chase, DVO’s Topaz T3 Air passed the Green Lake test (along with numerous other shakedown rides) with Strava KoM-killing colors. In climb mode, sag is roughly cut in half, helping keep bike and rider in a comfortable and efficient upright pedaling position. It’s not a total lock-out, though, which is just fine. I prefer maintaining traction over maximizing power output. And frankly with the Hightower’s effective VPP suspension, there isn’t much pedal-induced movement anyway. Fear not Specialized Stumpjumper and Enduro owners. 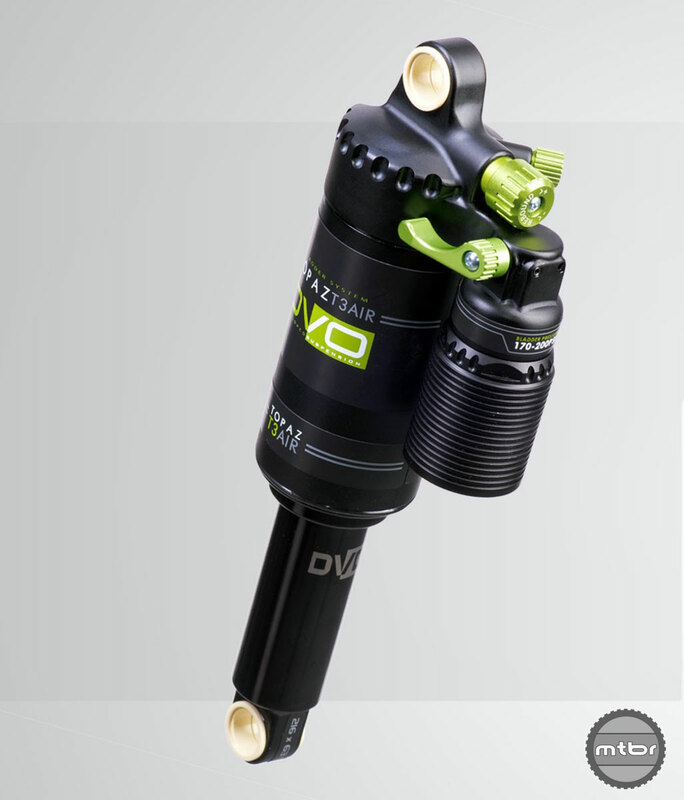 DVO is now making a compatible shock for you. Tinkerers will love the shock’s tunability. The included air volume spacers for the negative and positive can be added without tools or even taking the shock off the bike. Just release air pressure, remove the o-ring, slide back the can, snap on a spacer or two, re-inflate, and off you go. Most riders will make this adjustment at home. But you can do it trailside, too, which is great for getting initial set-up dialed. If you nail your sag number but are still blowing through full travel, add a spacer to the positive chamber. Or snap a spacer into the negative chamber to better preserve initial squish. Here’s a DVO tutorial video that illustrates just how easy it is. Of course nothing in the world is perfect. Uber tinkerers may balk at the absence of external high speed or low speed compression adjustment, and the rebound adjuster knob’s detents are subtle so you need to pay closer attention when turning. Also the compression adjustment lever’s fairly low spring tension makes it possible to inadvertently “adjust” on the fly, and I’ve managed to knock the air cap with my right knee a few times. Finally, it would be great to have sag percentage indicator lines. But none of these gripes are by any means deal breaking. Instead, I can enthusiastically say this one of the best piggyback shocks I’ve ridden. 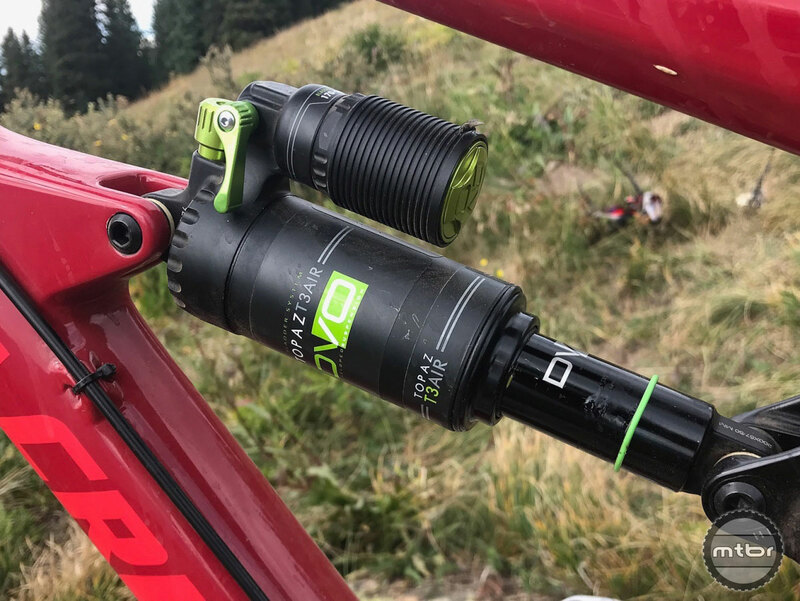 And while I have no issues with Fox or RockShox, it’s good to have more competent players in the mountain bike suspension game. Healthy competition is good for everyone — especially us riders. The Topaz T3 Air comes in this 007-like carrying case with shock pump and volume spacers incuded. Included air volume spacers for the negative and positive can be added without tools or even taking the shock off the bike. 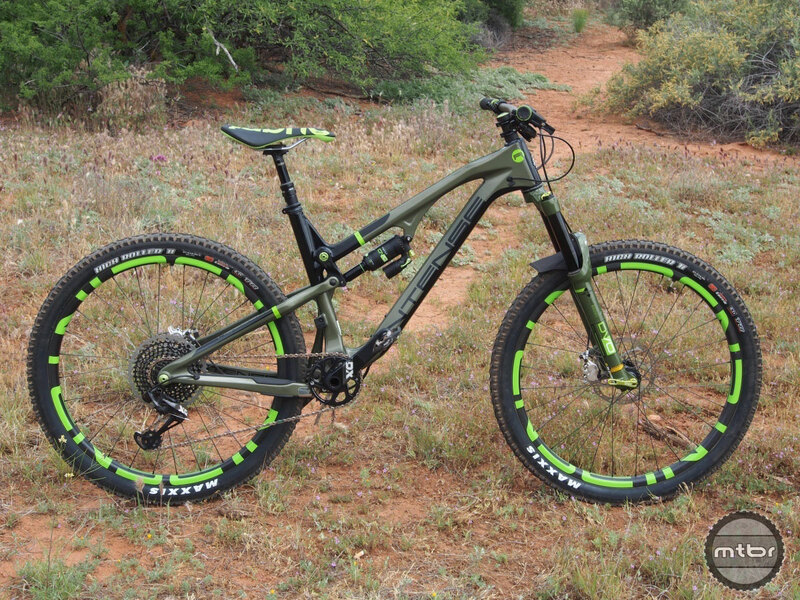 Intense are such big DVO fans they launched a special edition Recluse earlier this year outfitted with both the Topaz T3 Air and DVO Diamond fork. 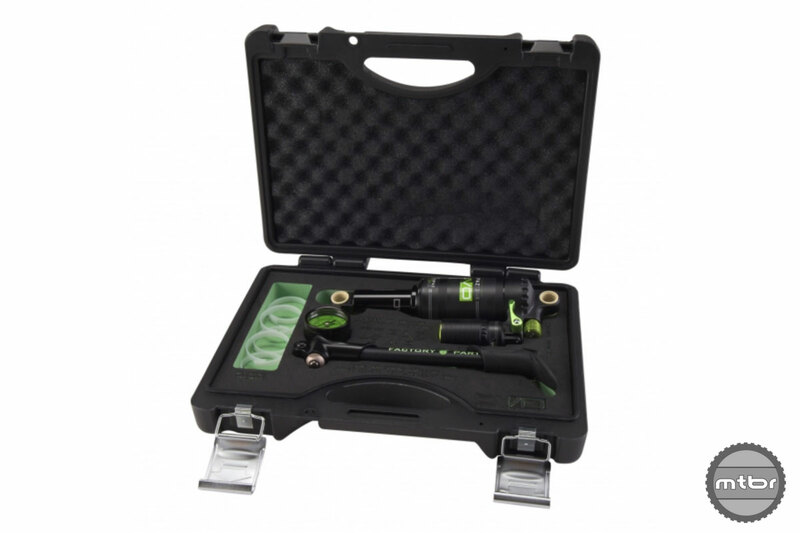 The Topaz T3 Air comes in this 007-like carrying case with shock pump and volume spacers. Currently the Topaz T3 Air comes in five sizes (216×63.5, 216×57.5, 200×57, 200×51, 190×50).